A couple days ago, I was scrolling down my Facebook news feed and bumped into a picture of my old friend holding pretty balloons in a party with the accompanying hash-tag #balloonphobia. I quickly commented on that photo "You too, afraid of balloons? I thought I was the only one who is weird." He said yes. So yeah, people. Yours truly has a balloon phobia. While people in general accept fear of heights, flying, blood or insects as normal, one's fear of balloons is often considered as a laughable or irrational subject matter. At least, my husband laughed at me and thought I was silly when he found out that I am afraid of balloons and tend to avoid places that have a lot balloons. I am certain that more people will label me as mental after they discover this particular phobia of mine. Nonetheless, I am not too bothered with that as I am really afraid of balloons and appreciate if you don't put me in a position where I have to deal with insane amount of balloons, ok. Thanks in advance. Haha. What are the symptoms of balloon phobia? Next, before we held Naomi's 3rd birthday party, I contemplated for weeks whether I should come clean and tell Naomi's teacher if he could make Naomi's birthday party balloon-less because I have a balloon phobia. I thought that move would be selfish because Naomi loves balloons just like other kids thus I kept quiet. As such, I pretended that nothing happened when more than 15 kids ran around with long colourful balloons during the party (dang, many balloons eventually popped too!). Deep inside, I was dying, man. Naomi's recent birthday party was in a room virtually full of balloons. Whenever possible, I really don't want to go to places that feature tons of balloons -- Now I wonder how I survived my wedding reception in Malaysia as our stage decoration was made of tons of white and pink balloons and children went gaga with the balloons on stage. I must have been out of my mind to endure that semi balloon-themed wedding party then. Further, I could not stand the sound of people or kids squeezing or rubbing inflated balloons - as if it's going to burst in front of my face any time soon and give me heart attack. Deflated balloons are harmless to me but I do feel very anxious and agitated the moment I see someone starts inflating balloons or throwing balloons in the air too. In summary, I fear the sight, thought and feel of balloons. And the feeling when I am exposed to balloon(s) can go from simply uneasy all the way to immense stress. I don't know. Maybe yes. Maybe no. However, I reckon there are some people who share the same morbid sentiments of any sort of balloons as me. I did some internet reading about fears of balloons and apparently there is a scientific term for it. Balloon phobia is also known as Globophobia and Oprah Winfrey is one of the sufferers. No idea.. It surely is not an overnight thing and I don't know why it happens to me. Not sure. My husband heard that a therapy can actually fix one's phobia but I don't think I need one lah. Just let this be... As long as no one hands me or asks me to be anywhere near balloons, I will be fine. Anyway, I am sharing this topic because I realized that I have a friend who has the same phobia and feel like writing about people who actually don't fancy balloons - at all. Now that I have come out of the closet with my confession on my embarrassing phobia, do you also have any uncommon phobia to share too? A couple days ago, I thought of clearing some veggies that had been sitting in my fridge for a tad too long.. I got plenty of tomatoes, sweet onions, a green capsicum and a box of fresh button mushrooms. When mixed together, I thought these vegetables would be great for a pizza. Without thinking too much, I decided to make a simple pizza dough with my bread maker and while waiting for the dough to slightly proof, I worked on the tomato sauce which recipe you can check here. The recipe of the pizza (crust) dough is adapted from here. It's relatively easy and fail-proof. As I was in a hurry when making my pizza the other day, I didn't wait for the dough to entirely proof and my pizza crust still turned out great and soft. I shaped the pizza dough with a rolling pin and didn't make it look so round and neat on purpose because a Chef from a cooking show in Food Network once said something like this "Your home/hand made pizza doesn't have to look perfect, otherwise it looks like a store-bought pizza". I took his advice all to heart and created a pizza that was not neat in shape. My home-made pizza had rustic look and tasted yummy. In fact, I think my pizza tasted exactly like the pizza that my Mom used to make back home... And I ate two slices not long after the hot pizza came out from the oven and it was not even lunch time yet. 1. Sift together both types of flour in a large bowl. Set aside. 2. As per the general bread maker function: Place fresh milk/water, sugar and salt in the bread maker. 3. Pour the flour then make a small hole in the flour. 5. Turn your bread machine on (I use the basic program). Once the mixture has turned into a dough, add the butter in. If you think the dough is too wet, add 1-2 tbs flour, as needed. If the dough is too dry, add 1 tsp of water at a time. 6. Let the dough sit for 30 minutes and knead again. 7. The dough will be smooth and well incorporated after the second kneading. Let the dough proof for another 30 minutes or so. 8. Once the dough has proofed, place the dough on a floured working surface and shape it with a rolling pin until you achieve the desired round shape. 9. Put the rolled dough in a lined tray and top the pizza dough with tomato sauce and whatever toppings you want to include. 10. Bake the pizza for about 18-25 minutes in a preheated oven at 160-170 degree Celcius until your cheese is bubbly (if you are putting Mozzarella) and the crust is slightly brown. I ran out of Mozzarella cheese when baking my pizza two days ago yet was lazy to go to the nearby supermarket just to pick a pack of Mozzarella. In the end, I scattered some cheese singles' cuts on top of my pizza when it was piping hot (just out from the oven) so the cheese would melt and this way, I would still have some cheese on my pizza. I purposely didn't put any cheddar cheese or cheese singles on the pizza before baking because I didn't want the cheese to turn hard and crispy after baking. Cheddar cheese doesn't melt as well as Mozzarella. Introducing ShopBack: Enjoy Extra Savings, Vouchers and Cashback from FoodPanda, Lazada, Zalora and More! Recently, I have been shopping via internet so frequently, especially to buy new items for my wardrobe, because online shopping is so addictive convenient, offers a vast array of products and we can compare prices from different shops easily before making purchase. Another thing that I love about online shopping is the discount codes and promotions from the online shops! Sometimes, I don't mind waiting for 1-2 weeks before purchasing the stuff that I really want simply because I want to see if the shop will be doing any sale or offering discount codes in the coming days. All of us naturally want to buy something at a discounted rate, don't we? Speaking of online shopping and savings, I would like to introduce you to the top cashback and online deals site in Malaysia, ShopBack Malaysia, where you literally can get cash back as you click through and shop from over 300 participating merchants in this site such as Taobao, Lazada, Zalora, FoodPanda, Groupon, Agoda, Expedia and many more. In a nutshell, by using ShopBack, on top of the benefiting from the existing discounts and voucher codes that the participating merchants offer, you can also get a percentage of your money spent back! How cool and smart is that? After you finished your online shopping and made payment, the cashback will be credited to your ShopBack account and later on, you can cash it out into your bank account or PayPal for real cash. Ding, ding, ding... Extra savings to all of you, avid online shoppers! 1. Go to https://www.shopback.my and register an account. You can choose to sign up with your Facebook account or email address. Note that you can earn extra money when you refer your friends to sign up for shopping with ShopBack. 2. Once you are signed in, you can check out all the super deals of the week, namely the promotions, discount offers (don't lose the stated discount code, if any) and the cashback potentials for your transaction with the participating ShopBack's merchants. 3. Click on the merchant that you are interested with. I choose Lazada for my example here. 4. Wait for few seconds while you are directed to your favourite shop... then you are ready to shop your goodies away! 5. Complete your purchase with the merchant or shop that you have chosen within the same window or browser. Once payment is made, your cashback will be added to your ShopBack account within 2 days. One more thing, to make your shopping experience faster and easier, you can also shop or find your favourite merchants by category in ShopBack. Find the "Categories" button on ShopBack homepage and choose the category that you are looking for. For instance, here I select the Food & Beverage category and click to get the best food and beverage deals! So remember, before you start your online shopping frenzy, make sure you head to ShopBack Malaysia (let your friends know about this too! ), sign up an account then browse through and enjoy the ongoing promotions from various participating merchants for extra discounts and savings! One last thing, ShopBack Malaysia is having a huge sale on 11/11/2015, in conjunction with the Singles' Day (notably the biggest shopping day in China!). 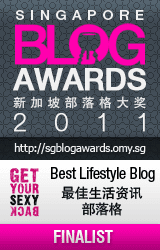 Further details will be released very soon, so do keep a look out on this one in ShopBack Malaysia's website! When my parents came over last month, we brought them to Singapore for sightseeing. 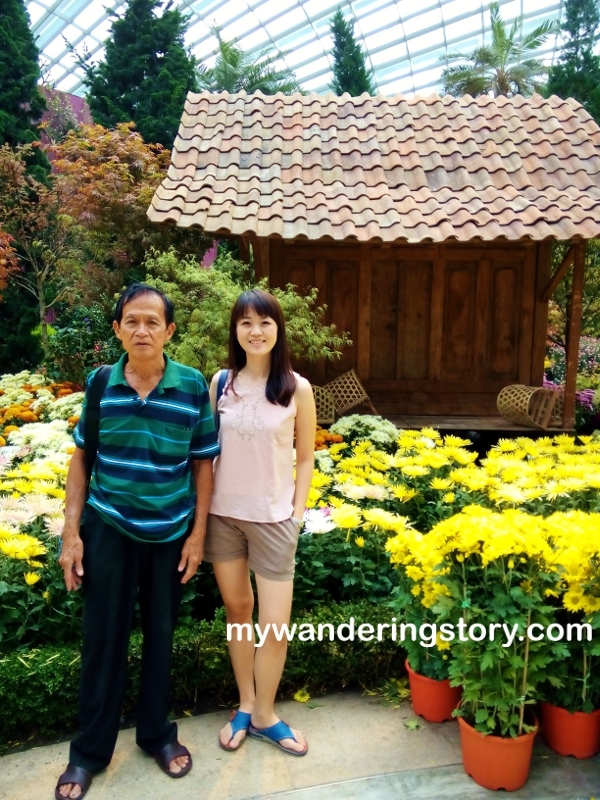 Every time they come to visit us, my husband and I usually bring them to a new place in Malaysia so when they go back to Indonesia, they'd have a new touristy place locked in their "Been There" list. 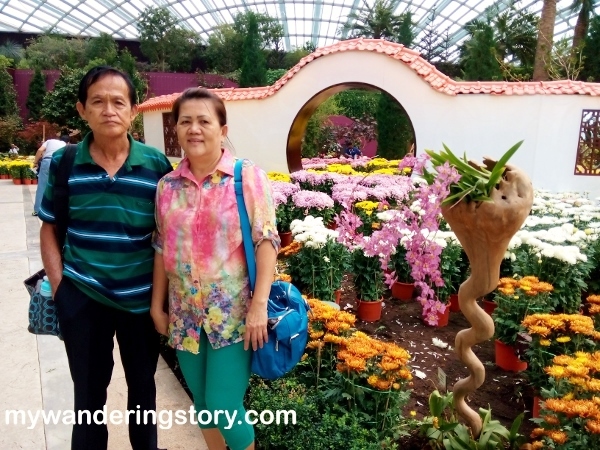 This time around, we chose to bring my parents to Singapore and let them see Gardens by the Bay, which I had actually yearned to visit for years but never had the opportunity to do so until last month. 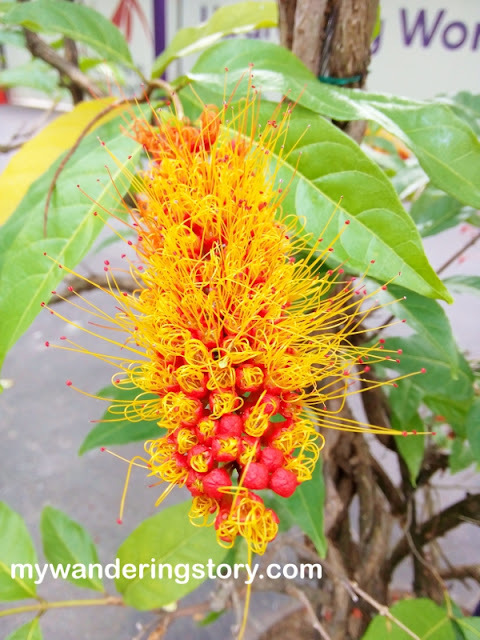 As such, when my husband agreed to visit this horticulture-themed leisure destination in Singapore with his parents and my parents, I was very excited. Furthermore, I was sure that my Mom, who loves gardening and flowers in general, would appreciate this place very much. So.. off we went to Singapore. Grumpy face in the morning. By noon, we arrived in Singapore and went straight to Gardens by the Bay, which was not so difficult to find with the assistance of Ms. GPS. Once we reached Gardens by the Bay, the first thing I sought was ATM machines. Call us crazy but we did come to Singapore with minimum cash and didn't exchange any RM to SGD in advance. All this because I still have some dollars in my Singapore's bank and planned to withdraw some cash in Singapore to fund our leisure visits there. Waiting for Mommy checking out the ATM Machine. Fortunately, we could buy our admission tickets with my husband's credit card, otherwise, how ah? Haha. Lady Boss waiting for Mom and Dad to buy the tickets. 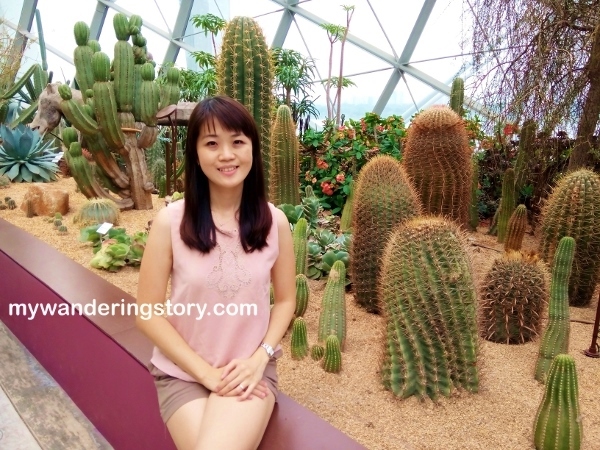 As my husband did not bring Naomi's stroller to Singapore and guessing that one conservatory in Gardens by the Bay would be a massive place to explore, we opted to visit the Flower Dome only. I knew that Naomi would be running around like mad inside the garden and we would not have the energy to keep up with her should we visit another conservatory. Also, RM value towards SGD dropped like hell last month, so we rain checked visiting other paid attractions available in the Gardens - until we bring Naomi's stroller next time. The moment I entered the Flower Dome, which size approximately equals to 2.2 football fields, my first reaction to my family about it was "Wow, this place is damn huge and so cool. Fully air-conditioned too!". As expected, the minute we stepped inside this indoor garden, our Energizer Bunny got very excited and ran around the gardens like she'd just been unleashed or something. My husband and I were trying hard to follow Naomi around and stop her from plucking any flowers in the garden because such action is obviously prohibited. Two minutes later, all of us regretted the fact that my husband did't bring Naomi's stroller to Singapore. Sigh x10000000000. Moving on, the first garden that greeted us in the Flower Dome was the Succulent Garden which hosts various waters-storing dessert plants. Naomi and the wall of succulents. I also have some mini succulents and cactus at home but why they look like nothing compared to those displayed in the Flower Dome, eh? Even the cactuses look good. While I normally consider succulents and cactuses as boring and plain type of plants, I must admit that when they are being showcased in the Flower Dome, they have become amazeballs. Meanwhile, I took turn in chasing Naomi around with my husband although mostly, he was the one who followed Naomi around. This is why, I tended to just wander around the garden and randomly admired whatever plants in front of me as I didn't want to lose sight of Naomi. My husband actually brought a camera with us, but thanks to Naomi who was constantly on the move, he had no mood to take nice proper pictures of us or the beautiful flowers and unique plants surrounded us that day. Angry toddler wanted to run around. 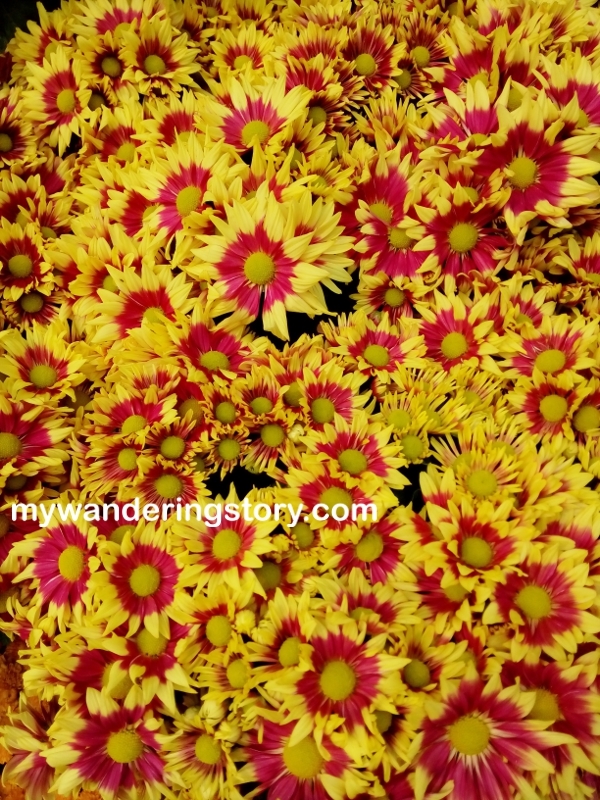 Despite our issues in managing Naomi in an open space; luckily our parents, especially my Mom, were still able to stop and smell the flowers and examine the various plants collection at the Flower Dome such as the colourful chrysanthemums, bottled trees, orchids and many more. Angry kid when asked to stay still. They took lots of pictures with the Flower Dome's scenery and had a close look at each plant they found interesting. My parents and I with the marguerites. My Dad is not famous for his photography skills so I tried my best to help my Mom take pictures with the flowers. Then, whenever my mood was better (after being so angry at Naomi who didn't want to stay still), I also asked my Mom to snap some pictures of me with some pretty flowers as mementos. Trying to be happy despite the chaos during holiday. 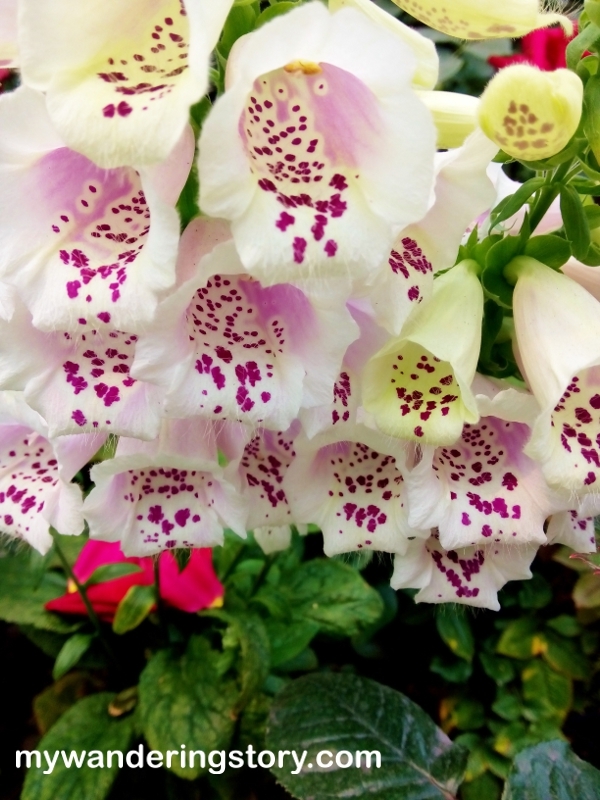 Here are some beautiful flowers pictures that my Mom captured with her phone in the Flower Dome. She actually took tons of the flowers pictures but I am too lazy to edit and post all of them here, so here I give you some of the snippets only. And here is the view of a part of the Flower Dome from above. 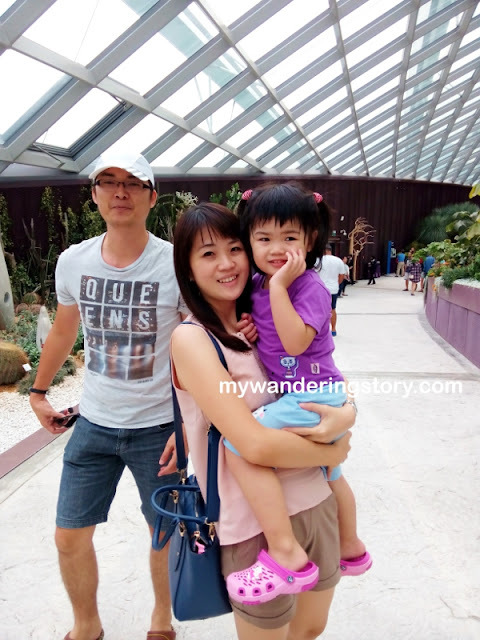 My poor husband literally had not much time and mood to take pictures while we were at Gardens by the Bay because he was so busy carrying and taking care of Naomi and wanted to make sure that we all had the chance to enjoy some leisure stroll in the garden. As a result, he had not many pictures taken while we were in Singapore last month. Too bad. 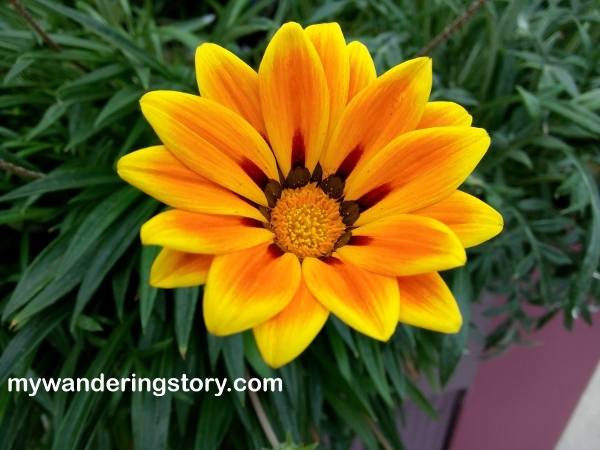 By the time we circled half of the Flower Dome, I think our Energizer Bunny's time to recharge her battery was up. She needed to nap but was still restless somehow. Alas, one after another tantrums were thrown in public... If only we had a stroller and we could put her inside it for a while and take a breather! The child was hungry and tired but refused her milk. Only God knows how many toddler meltdowns we dealt that afternoon. Nonetheless, we still managed to snap some family pictures with the flowers. Else, I'd really think our visit all the way to Gardens by the Bay was so wasted. The last bits of the Flower Dome that we saw was a garden that is quite similar to Chinese or Japanese Garden, I think. My parents with the Chinese or Japanese Garden as the background... Not sure. The last garden displayed lots of pretty and unique looking chrysanthemums and orchids. When we almost finished visiting the Flower Dome, my Dad's interest in taking photos was obviously went down to 0 hence his annoyed expression below. My old man and I. Before we concluded our visit to Flower Dome, my Mom maximized her chance to take photo of almost every flowers she could find. She must have found the experience to visit such a huge garden with a myriad of blooming flowers precious. On the other hand, my Dad got impatient waiting for my Mom taking pictures of this and that flowers and commented that my Mom was like a young kid who can't stop using her phone to take pictures bla bla bla. Rare orchids picture from my Mom's phone. When we left Flower Dome, the clock showed 3pm and all of us were so famished because we had not our lunch. We should have eaten something before we entered the garden! Since we were so hungry already, we decided to just go to one of the restaurants within Gardens by the Bay's premise. We were told by the information counter that the nearest restaurant around the garden would be the SuperTree Dining. However, why did I feel that we had to go for an extremely long walk to reach to that restaurant...? I literally had to drag my feet to get to the restaurant... Was it because our tummies were rumbling and we had to take turn in carrying Naomi while walking? Once we reached to the restaurant, we quickly ordered our late lunch and our food roughly cost about SGD 10 per pax. The food was not bad and the portion was considered big, especially the chicken thighs. Energizer Bunny recharging her battery while we were eating. Done with our late lunch, we decided not to go back to Malaysia immediately yet didn't plan to visit another tourist destination in Singapore either because I was drop dead tired and feverish too. Next, I suggested the idea to join the Outdoor Gardens Audio Tour at Gardens by the Bay so we got to chekc out other parts of the Gardens that we could not reach by foot. Everyone said okay so after taking hefty amount of pictures with the iconic SuperTree Groves somewhere near the restaurant, we walked back to the information counter to get the tickets for the Audio Tour. 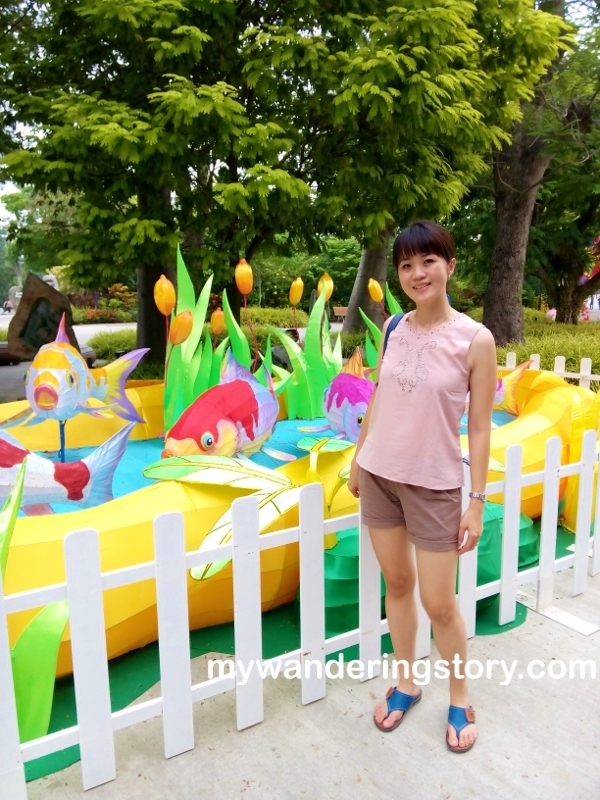 The Audio Tour costs SGD 8/pax (for adults) and SGD 3/child and it encompasses a leisurely 25 minutes ride around the Bay South Garden on a 22-seater Garden Cruiser tram. Waiting for the Audio Tour to start. I quite enjoyed this tour because I didn't have to sweat and stress while exploring some other parts of the Gardens. We got to know the Cooled Conservatories, Themed Gardens, Meadow and also the Supertree Grove so overall, I think the tour ride was worth the price. Thankfully, the haze on that day was not so bad so our outdoor activity around the Garden was quite enjoyable. 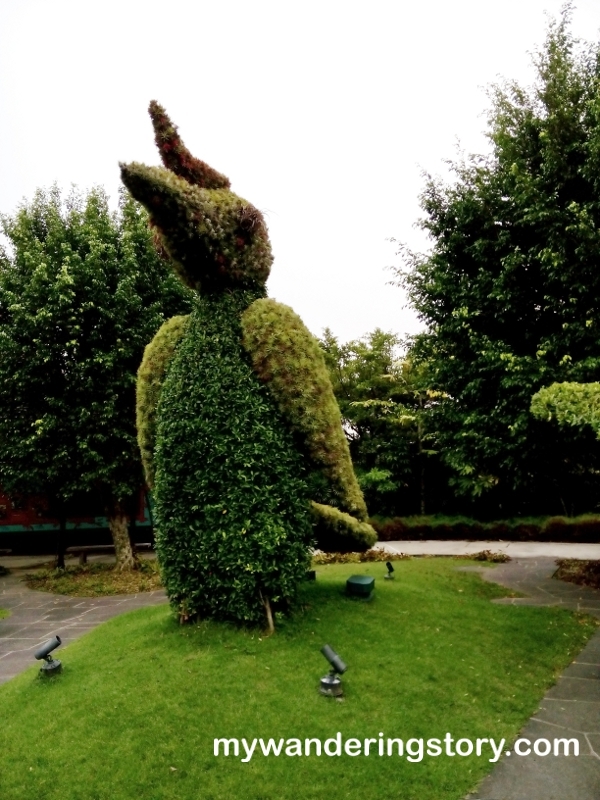 The penguin tree in the Themed Garden. In conjunction with the Mooncake Festival last month, some parts of the outdoor gardens were also decorated accordingly. The outdoor gardens were quite interesting to check out too but again, since most of us were so exhausted already, we could not really enjoy the outdoor garden scenery thoroughly nor take pictures with the decorations. I think, if we go to Singapore for holiday and had never been to Gardens by the Bay, visiting Gardens by the Bay is a must because this place is so beautiful and worth visiting. Not to mention that Supertree Groves have now become one of Singapore's icons too, I think? So somehow we must take photos with them? Haha. Caterpillar-like flower that my Mom snapped on our way back to the parking lot. Lastly, if you are travelling to Gardens by the Bay with a toddler or baby, please don't forget to bring your stroller. Stroller is so important for a holiday that involves long stroll such as this one otherwise what is supposed to be a leisure stroll in the garden will easily turn into a nightmare stroll in the garden. In fact, you can use the stroller for your kid or store his or her heavy bag since lugging your kid's bulky diaper bag around the garden is not going to be fun either. For Naomi's 3rd birthday party, initially I thought of baking small cupcakes the morning before the party started so she'd have a small birthday dessert table. However, after some considerations, I decided to scrap the idea of making mini cupcakes for the party since we'd have A LOT of cakes from the 2kg birthday cake that evening... So better not to bring extra cakes of sort for the party then. Also, I was so lazy to create sweet treats that would require baking and messy frosting on the day when we'd have to prepare for Naomi's party. As such, I came up with the idea of making my favourite childhood non-bake snacks, Chocolate Rice Balls or Bola-Bola Coklat Meses, instead. Chocolate Rice Balls for the kids. These kid-friendly chocolate balls are easy to make, taste yummy and bring back a lot of childhood memories (if you are born in Indonesia during the 80's or early 90's). I remember chocolate rice balls were like our once-in-a-blue-moon indulgence from my Dad because they were not so cheap 20-25 years ago. My daily pocket money during primary school was certainly not enough to buy these sweet treats. Anyway, I made the chocolate balls with the help of my Mom so the process of making these treats was very enjoyable and fun. We both laughed a lot during the dough making as it was our first time in making these chocolate balls. Here's the recipe that I used to make the mini chocolate balls. A mini blast from the past. 1. In a large bowl, mix together the crushed biscuits and icing sugar. You can actually omit the icing sugar here because the final result of the rice balls is already sweet. 2. Add in the butter and condensed milk to the dry mixture. Mix until all the ingredients are well combined and form a dough.You might need to add or reduce the amount of the condensed milk used to the dough. Just stop adding the condensed milk once you reach the dough consistency that is form-able into mini balls that can stick to the chocolate rice. 3. Take a small pinch of the dough. Roll into mini balls and evenly cover the mini balls with the chocolate rice or colourful sprinkles. 4. Place each choco ball in a mini cupcake case. Decorate with some cupcake toppers, if you like. So simple and easy, yes? Aren't they cute after they are topped with mini dinosaurs? You can also add some thinly chopped nuts for the dry ingredients or melted cooking chocolate as part of the dough's liquid ingredients to make the chocolate balls taste better and richer. I think this recipe is quite versatile. You just have to make sure that your dough is not too dry or too wet so you can create small balls that can be covered with the chocolate rice. If your dough is too dry or not wet enough, the chocolate rice won't stick to the mini balls evenly. My darling Naomi turned 3 two Sundays ago but since I was so crazy busy lately, I can only blog about it now. As previously shared, we celebrated Naomi's 3rd birthday party in her play school/day care with her friends and teachers. I had also flown my parents from Indonesia to Malaysia so they got to celebrate Naomi's small birthday celebration this year. The party was planned to commence at around 4.30pm in view that if we held the party before 12, many (day care) kids would cry when the party was over and when they noticed us leaving the school in the afternoon. As such, Naomi's teacher suggested us to hold the party just before the kids go home in the evening. No biggie, I obliged. For Naomi's birthday this year, I selected a cute dinosaur theme. Reason is Naomi was so into dinosaurs back in late August and early September when I was planning her mini birthday party. Back then, whenever she saw dinosaurs on TV or books, she'd smile, point at them and scream "Dinosaurs! Aaargh!". Whenever she saw crocodile or rhino, she'd claim them as "Dinosaurs!" too. When we went to toy shops, she was keen to bring some dinosaurs miniatures home too. I wonder why she was so obsessed with dinosaurs instead of Hello Kitty or Olaf. Are these two adorable characters way too mainstream for her liking? As dinosaurs sounded so boyish to me and my girl's temporary heartthrob then happened to be dinosaurs, I thought of coming up with a birthday celebration that was in line with her current interest. In addition, I embedded a slight girly touch to the dinosaur theme so it was not looking so tomboy. DIY party bags for the birthday party. We celebrated Naomi's birthday in her school a day after her actual birthday because our culture in Indonesia forbids celebrating one's birthday before his or her actual birthday dues. Since Naomi's birthday party was in late afternoon, my Mom and I decided to make extra chocolate snacks for the kids after our lunch. We spent some time making the chocolate balls's dough, rolling them into small balls and decorating them with rainbow chocolate rice and dinosaur labels. Home made sweet treat for the birthday party. Tick.. tock.. tick.. tock.. Finally... The time that we had been waiting for, Monday - 4.30pm, was about to come and we quickly put all the party goodies inside the car. However, just before my parents and I drove to Naomi's school to get her birthday stuff ready, glorious heavy rain dropped! What a timing. The sky was so dark and pouring hard, not to mention the strong wind too. MIL who planned to attend Naomi's party had to cancel her attendance because of this sudden torrential rain. My parents and I arrived to Naomi's school at 4pm ++ and Naomi's teacher had decorated the school's multi-purpose area with some balloons. Some kids were already running around the area while playing with colourful balloons. All decorations, except the name banner, were prepare by Naomi's teacher. When we reached the school, Naomi was already dressed in her new birthday dress that my Mom bought in Surabaya. Not long after we arrived, my husband joined us too. Greetings from the birthday girl! Further, although all of us were ready to start the party, we could not start the party as yet because some of the Naomi's friends had not finished drinking their afternoon milk in the cups. Waiting for the kids to drink their milk. Some of the children really found it too laborious to gulp a cup of milk so it took almost forever waiting for them to finish the milk. Haha. Meanwhile, I don't know what happened but suddenly the kids were so engrossed playing with my husband. My husband casually asked one of Naomi's friends who was a chatterbox, "How old are you? (你几岁了?)" The boy answered him, "I sleep at 9pm. (我九点睡了.)" My husband asked him the same question once more and he shared the exact same answer again. This boy was so hilarious. Full stop. 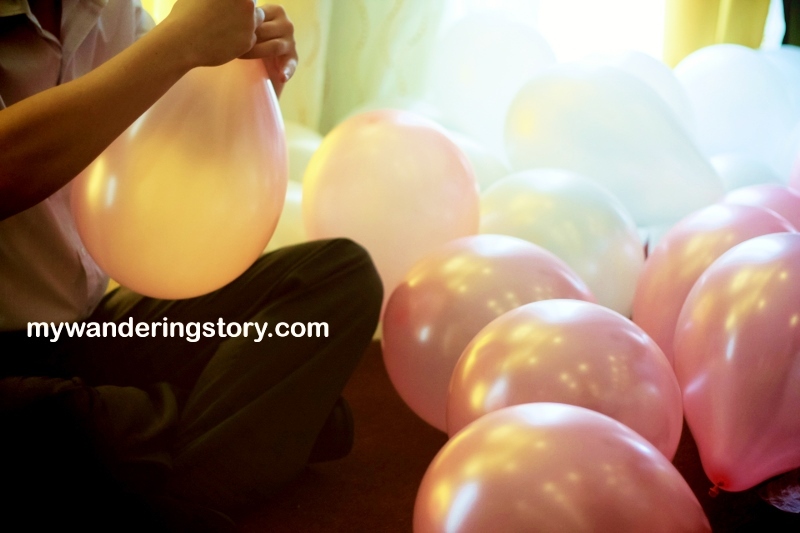 Naomi's friends attacked her Dad with balloons while waiting for the party to begin. I didn't check the clock to see when we finally kicked off Naomi's birthday party, but the party began with some photo sessions with the birthday girl and her simple dessert table. Naomi was very uncooperative during her birthday party I nearly lost my patience. It's either my Dad or Naomi who didn't look at the camera. Naomi literally refused to stay still and look at the camera, transformed herself into Queen Greedy and forced me to open the birthday party bags that were meant to be distributed to her friends. Basically during the photo sessions, all Naomi cared about was the snacks inside the party bag that she already tore and put in her mouth. After the photo sessions with family and Naomi's friends and teachers, all of us heartily sang the birthday song to the birthday girl. When the birthday song was sung. This year, Naomi demonstrated more confidence and appreciation when she heard her friends and teachers sang the birthday song out loud. She was not shy at all. In fact, she also tried to sing along the song with them. They were all so cute. After singing the birthday song and blowing the birthday candles, each child in the room was given a chocolate ball and a slice of the birthday cake. Distributing the chocolate balls to the kids. I think the kids were still full from their afternoon milk or maybe they didn't like cake or what... but almost half of Naomi's three-tiered fruit birthday cake ended up in the garbage bin. So much food wastage... Lesson learnt, maybe next time, we don't need to invest on a huge cake for the birthday celebration with a bunch of toddlers. Also, giving a smaller slice of cake to the little friends will probably make more sense. We don't intend to be stingy about the cake here, it's just that it was really a pity witnessing the cakes went straight to the garbage bin while most of them were hardly eaten. For the last procession before Naomi's birthday party ended, the birthday girl was supposed to pass the party bag to each of her friends before they went home. As expected, considering that the birthday girl was notably so greedy and stingy, she was totally against the concept of giving her friends their party bags. I believe she thought Mommy painstakingly prepared a giant box full of DIY party bags just for her. Anyway, after Naomi's teachers distributed all the party bags to Naomi's friends, Naomi's birthday party was concluded. Minutes later we packed our things and went home. With this... Naomi's big day of the year was over. (BTW, Naomi's teacher reported that Naomi distributed her party bags to some of her friends who missed the party on the next day just fine. Somehow our presence during her party made her behave differently and acted so spoiled that evening). At home, my Mom complained to me because she didn't get to take picture with the birthday girl alone as Naomi was always distracted and moved a lot during the party. I then made Naomi take some pictures with Grandma since Grandma was so eager to take pictures with Naomi dressed in the beautiful dress she bought all the way from Surabaya.. but again, this attempt failed miserably. Naomi just was not in the mood of photo taking at all that day. Last but not least, belated happiest birthday to you, Naomi, the child who stole my heart. May you grow as a healthy, beautiful, kind, clever and happy little girl. Mommy wishes you nothing but the best, love.